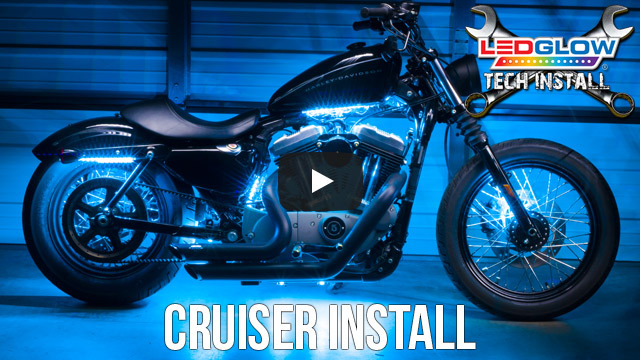 LEDGlow’s Advanced Red SMD LED Motorcycle Lights is the next generation of motorcycle lighting as it adds a complete and spotless glow to any motorcycle by utilizing SMD technology that standard 5mm LEDs cannot compete with. 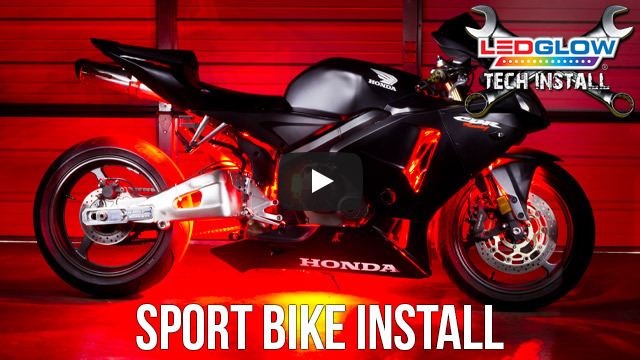 What are the major differences between the SMD motorcycle kit and the standard LED motorcycle kit? To simply put it, the SMD lighting kits are much brighter by featuring more LEDs and the light strips are much thinner than the standard LED motorcycle kit. The Red SMD Motorcycle Kit features an expanded LED count with its SMD chips, resulting in more LEDs working together to bring a vibrant aura surrounding your bike. A single SMD chip contains 3 concentrated LEDs, which produce a much brighter, wide angle illumination with less spotting than standard 5mm LEDs. Another major difference between the SMD lighting kits and the standard LED light kits is that the light strips for the SMD kit are much thinner and are able to be mounted in tighter areas, completely hiding the strip and exposing a more complete, vivid glow. These red motorcycle LED lights are offered in 6pc – 18pc kit options packed with an assortment of innovative abilities and safety features. The included waterproof control box features a solid color mode with 4 brightness levels, 3 flashing modes and 1 fading mode that are all easily selected using one of the two wireless remotes. The waterproof control box features a new, unique round design that measures at 1 5/8” in diameter and 5/8” in height making it extremely easy to hide under the seat. Attached to the control box is 18” of wire with a male modular connector that connects to the power harness and 12” of power and ground wires that connect to the battery. The power wire features a waterproof 2 amp inline blade fuse that protects the power circuit of the control box. Each 1/8” in depth, waterproof light strip comes included with 4’ of power wire for maximum mounting capabilities and is able to be cut every two SMD chips for easier mounting on smaller and tighter locations. LEDGlow includes installation instructions, a one year limited warranty and free lifetime technical support with each purchase. Easy to purchase, quick knowledgeable customer service representatives, fast order processing and shipping. Easy to install. Install instructions and video extremely helpful and thorough. Would definitely purchase form LEDGlow again. I new what I wanted but could not find it until I can across these light. They look great on my softail ! And we’re fairly easy to install. Definitely very happy with the purchase ! Even had a live chat on line for any questions! Great product was surprised with the quality, brightness, and how easy it was to install!! Plan on ordering again soon, for my other projects!!! These are good lights just like to have some more sizes to choose from. Anyone can do this install! You don't have to mechanically inclined, just competent. The kits is of great quality. The lights are super bright, the wireless controller has a metal front case so it's not 100% plastic. I like this because it doesn't appear to be a cheap remote. Great quality remote, great quality and super bright lights plus a slim fitting receiver. Excellent product.